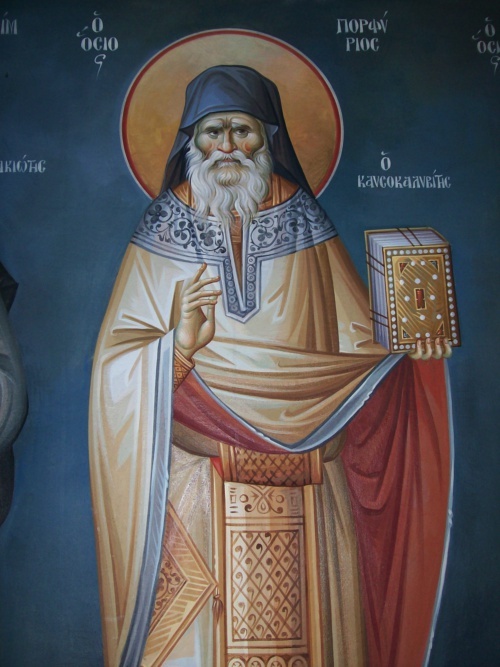 On Tuesday, November 27, 2013, the Sacred and Holy Synod of the Ecumenical Patriarchate decided the formal inclusion in the List of Saints of the Orthodox Church of elder Porphyrios of Kafsokalivia and of venerable Meletios of Lardos. Feast Day of Saint Porphyrios of Kafsokalivia: December 2nd. Feast Day of Saint Meletios of Lardos: February 12th. Elder Porphyrios was born on the 7th of February 1906, in the village of St. John Karystia, near Aliveri, in the province of Evia. His parents were poor but pious farmers. His father’s name was Leonidas Bairaktaris and his mother’s was Eleni, the daughter of Antonios Lambrou. At baptism he was given the name Evangelos. He was the fourth of five children, and the third child of the four that survived. His oldest sister, Vassiliki, passed away when she was a year old. Today, only his youngest sister, who is a nun is still alive. His father had a monastic calling but obviously did not become a monk. He was, however, the village cantor, and St. Nectarios called upon his services during his journeys through the area, but poverty forced him to emigrate to America to work on the construction of the Panama canal. The Elder attended the school in his village for only two years. The teacher was sick most of the time and the children didn’t learn much. Seeing the way things were, Evangelos left school, worked on the family farm and tended the few animals that they owned. He started working from the age of eight. Even though he was still very young, in order to make more money, he went to work in a coal mine. He later worked in a grocer’s store in Halkhida and in Piraeus. His father had taught him the Supplicatory Canon (Paraklisis) to the Mother of God (Panagia), and whatever else of our faith he could. As a child he developed quickly. He himself told us that he was eight years old when he first started shaving. He looked much older than he actually was. From his childhood he was very serious, industrious and diligent. While he was looking after the sheep, and even when working in the grocer’s store, he slowly read the life story of St. John the Hut-dweller. He wanted to follow the example of the saint. So he set off for Mt. Athos many times, but for various reasons he never made it and returned home. Finally, when he was about fourteen or fifteen years of age, he again left for Mt. Athos. This time he was determined to make it and this time he did. The Lord, who watches over the destinies of us all, brought about things in such a way that Evangelos met his future spiritual father, the hieromonk Panteleimon, while he was on the ferry boat between Thessaloniki and the Holy Mountain [Mt. Athos] Father Panteleimon immediately took the young boy under his wing. Evangelos was not yet an adult, and so should not have been allowed on the Holy mountain. Fr. Panteleimon said he was his nephew and his entrance was assured. His elder, Fr. 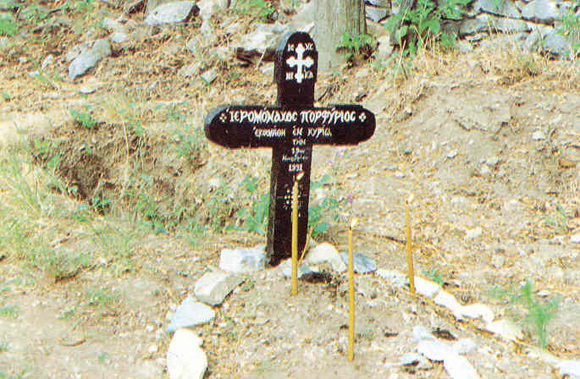 Panteleimon, took him to Kavsokalyvia to the Hut of St. George. Fr. Panteleimon lived there with his brother Fr. 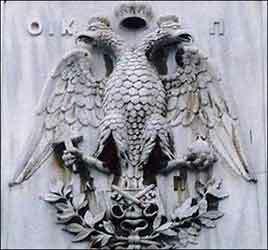 Ioannikios. The well-known monk, the blessed Hatzigeorgios had once lived there too. In this way, Elder Porphyrios acquired two spiritual fathers at the same time. He gladly gave absolute obedience to both of them. He embraced the monastic life with great zeal. His only complaint was that his elders didn’t demand enough of him. He told us very little about his ascetic struggles and we have few details. From what he very rarely said to his spiritual children about it, we can conclude that he happily and continuously struggled hard. He would walk barefoot among the rocky and snowy paths of the Holy Mountain. He slept very little, and then with only one blanket and on the floor of the hut, even keeping the window open when it was snowing. During the night he would make many prostrations, stripping himself to the waist so that sleep would not overcome him. He worked; wood-carving or outside cutting down trees, gathering snails or carrying sacks of earth on his back for long distances, so that a garden could be created on the rocky terrain near the Hut of St. George. However, the distinguishing mark of his ascetic struggle was not the physical effort he made, but rather, his total obedience to his elder. He was completely dependent upon him. His will disappeared into his elder’s will. He had total love faith and devotion for his elder. He identified himself completely with him, making his elder’s conduct in life his own conduct. It is here that we find the essence of it all. It is here, in his obedience, that we discover the secret, the key to his life. This uneducated boy from the second grade, using the Holy Scriptures as his dictionary, was able to educate himself. By reading about his beloved Christ he managed in only a few years to learn as much as, if not more than, we ever did with all our comforts. We had schools and universities, teachers and books, but we did not have the fiery enthusiasm of this young novice. We do not know exactly when but certainly not long after reaching the Holy Mountain, he was tonsured as a monk and given the name Nikitas. We should not find it strange that divine grace should rest upon this young monk who was filled with fire for Christ and gave everything for His love. He never once considered all his labors and struggles. was still dawn, and the main church of Kavsokalyvia was locked. Nikitas, however, was standing in the corner of the church entrance waiting for the bells to ring and the doors to be opened. He was followed by the old monk Dimas, a former Russian officer, over ninety years old, an ascetic and a secret saint. Fr. Dimas looked around and made sure that nobody was there. He didn’t notice young Nikitas waiting in the entrance. He started making full prostrations and praying before the closed church doors. The change wrought by the Holy Spirit. Following the visitation of the Holy Spirit, a fundamental change took place in the psychosomatic makeup of young Monk Nikitas. It was the change that comes directly from the right hand of God. He acquired supernatural gifts and was vested with power from on high. The first sign of these gifts was when his elders were returning from a far-away journey, he was able to “see” them at a great distance. He “saw” them there, where they were, even though they were not within human sight. He confessed this to Fr. Panteleimon who advised him to be very cautious about his gift and to tell no-one. Advice which he followed very carefully until he was told to do otherwise. More followed. His sensitivity to things around him became very acute and his human capacities developed to their fullest. He listened to and recognized bird and animal voices to the extent that he knew not just where they came from, but what they were saying. His sense of smell was developed to such a degree that he could recognize fragrances at a great distance. He knew the different types of aroma and their makeup. After humble prayer he was able to “see” the depths of the earth and the far reaches of space. He could see through water and through rock formations. He could see petroleum deposits, radioactivity, ancient and buried monuments, hidden graves, crevices in the depths of the earth, subterranean springs, lost icons, scenes of events that had taken place centuries before, prayers that had been lifted up in the past, good and evil spirits, the human soul itself, just about everything. He tasted the quality of water in the depths of the earth. He would question the rocks and they would tell him about the spiritual struggles of ascetics who went before him. He looked at people and was able to heal. He touched people and he made them well. He prayed and his prayer became reality. However, he never knowingly tried to use these gifts from God to benefit himself. He never asked for his own ailments to be healed. He never tried to get personal gain from the knowledge extended to him by divine grace. Even after being overshadowed by divine grace, this young disciple of the Lord continued in his ascetic struggles as before, with humility, godly zeal and unprecedented love of learning. The Lord now wanted to make him a teacher and shepherd of His rational sheep. He tried him out, measured him up, and found him adequate. Monk Nikitas never but never thought of leaving the Holy Mountain and returning to the world. His divine all-consuming love for our Savior drove him to wish and to dream of finding himself in the open desert and, except for his sweet Jesus, completely alone. However, severe pleurisy, finding him worn down from his superhuman ascetic struggles, caught hold of him while he was gathering snails on the rocky cliffs. This forced his elders to order him to take up residence in a monastery in the world, so that he could become well again. He obeyed and returned to the world, but as soon as he recovered he went back to the place of his repentance. He again fell ill; this time his elders, with a great deal of sadness, sent him back into the world for good. Thus, at nineteen years of age, we find him living as a monk at the Monastery Lefkon of St. Charalambos, close to his birthplace. Nevertheless he continued with the regime he had learnt on the Holy Mountain, his psalms and the like. He was, however, forced to scale down his fasting until his health got better. It was in this monastery that he met the Archbishop of Sinai, Porphyrios III, a visiting guest there. From his conversation with Nikitas he noticed the virtue and the divine gifts that he possessed. He was so impressed that on the 26th of July 1927, the feast of St. Paraskevi, he ordained him a deacon. The very next day, the feast of St. Panteleimon, he promoted him to the priesthood as a member of the Sinaite Monastery. He was given the name Porphyrios. 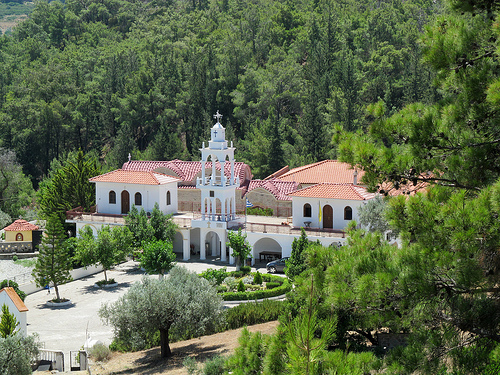 The ordination took place in the Chapel of the Holy Metropolis of Karystia, in the Diocese of Kymi. The Metropolitan of Karystia, Panteleimon Phostini also took part in the service. Elder Porphyrios was only twenty-one years old. After this the resident Metropolitan of Karystia, Panteleimon appointed him with an official letter of warrant to be a father confessor. He carried out this new “talent” that was given him with humanity and hard work. He studied the “Confessor’s Handbook.” However, when he tried to follow to the letter what it said regarding penance, he was troubled. He realized that he had to handle each of the faithful individually. He found the answer in the writings of St. Basil, who advised, “We write all these things so that you can taste the fruits of repentance. We do not consider the time it takes, but we take note of the manner of repentance.” (Ep.217no.84.) He took this advice to heart and put it into practice. Even in his ripe old age he reminded young father confessors of this advice. 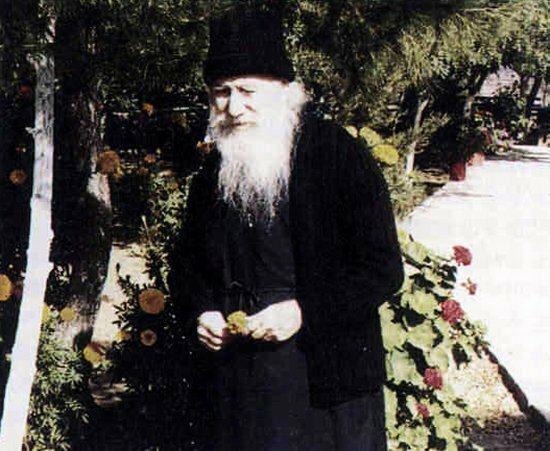 young hieromonk Porphyrios, by God’s grace, applied himself successfully to the work of spiritual father in Evia until 1940. He would receive large numbers of the faithful for confession every day. On many occasions he would hear confession for hours without a break. His reputation as a spiritual father, knower of souls, and sure guide, quickly spread throughout the neighboring area. This meant that many people flocked to his confessional at the Holy Monastery of Lefkon close to Avlona, Evia. Sometimes whole days and nights would pass by with no let-up and no rest, as he fulfilled this godly work, this sacrament. He would help those who came to him with his gift of discernment, guiding them to self-knowledge, truthful confession and the life in Christ. With this same gift he uncovered snares of the devil, saving souls from his evil traps and devices. In 1938 he was awarded the office of Archimandrite from the Metropolitan of Karystia, “in honor of the service that you have given to the Church as a Spiritual Father until now, and for the virtuous hopes our Holy Church cherishes for you” (protocol no. 92/10-2-1938) as written by the Metropolitan. The hopes of whom, by the grace of God, were realized. Priest, for a short time at the parish of Tsakayi, Evia and to the Monastery of St. Nicholas of Ano Vathia. He was assigned by the resident Metropolitan as a priest to the village of Tsakayi, Evia. Some of the older villagers cherish fond memories of his presence there to this day. He had left the Holy Monastery of St. Charalambos because it had been turned into a convent. So, around 1938 we find him living in the ruined and abandoned Holy Monastery of St. Nicholas, Ano Vathias, Evia, in the jurisdiction of the Metropolitan of Halkhida. When the turmoil of the Second World War approached Greece, the Lord enlisted His obedient servant, Porphyrios, assigning him to a new post, closer to his embattled people. On the 12th of October 1940 he was given the duty of temporary priest to the Chapel of St. Gerasimos in the Athens Polyclinic, which can be found on the corner of Socrates and Pireaus Street, close to Omonia Square. He himself requested the position out of the compassionate love he had for his fellows who were suffering. He wanted to be near them during the most difficult times in their lives, when illness, pain and the shadow of death showed the hopelessness of all other hope except for hope in Christ. Here as well as the role of chaplain, which he carried out with complete love and devotion, celebrating the services with wonderful devotion; confessing, admonishing, healing souls and many times bodily ailments too, he also acted as spiritual father to as many of those that came to him. Elder Porphyrios, with his lack of academic qualifications, agreed to be chaplain of the Polyclinic for a salary of next to nothing. It was not enough to support himself, his parents and the few other close relatives who relied on him. He had to work for a living. He organized in succession, a poultry farm and then a weaving-shop. In his zeal for services to be celebrated in the most uplifting manner, he applied himself to the composition of aromatic substances which could then be used in the preparation of the incense used in divine worship. In fact in the 1970’s he made an original discovery. He combined charcoal with aromatic essences, now censing the church with his own slow-burning charcoal that gave off a sweet fragrance of spirituality. He never, it seems, revealed the details of this discovery. From 1955 he leased the small monastery of St. Nicholas, Kallisia, which belongs to the Holy Monastery of Pendeli. He systematically cultivated the land around it, putting in a lot of hard work. It was here that wanted to establish the convent which he eventually built elsewhere. He improved the wells, built an irrigation system, planted trees, and tilled the soil with a digging machine that he worked himself. All this together with duty, twenty-four hours a day, as chaplain and confessor. On the 16th February 1970, having completed thirty-five years of service as a priest, he received a small pension from the Hellenic Clerical Insurance Fund and left his duties at the Polyclinic. In essence, however, he remained until his replacement arrived. Even after that he continued to visit the Polyclinic to meet his great number of spiritual children. 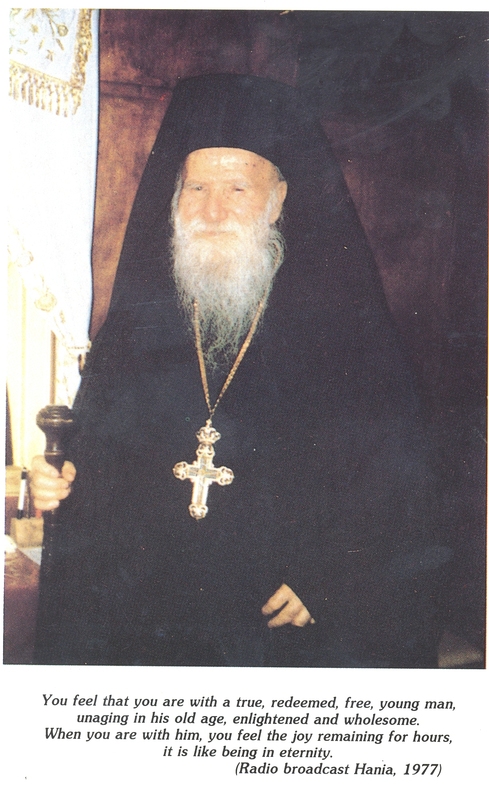 Finally, around 1973, he minimized his visits to the Polyclinic and instead received his spiritual children at St. Nicholas’ in Kallisia, Pendeli, where he celebrated the liturgy and heard confession. Elder Porphyrios, in addition to the illness that forced him to leave Mt. Athos, and that kept his left side especially sensitive, suffered with many other ailments, at various times. Towards the end of his service at the Polyclinic he became ill with kidney trouble. However, he was operated on only when his sickness was in its advanced stages. This was because he worked tirelessly despite his illness. He had become used to being obedient “unto death.” He was obedient even to the director of the Polyclinic, who told him to put off the operation, so that he could celebrate the services for Holy Week. This delay resulted in him slipping into a coma. The doctors told his relatives to prepare for his funeral. However, by divine will, and despite all medical expectations, the Elder returned to earthly life to continue his service to the members of the Church. Some time before that, he had fractured his leg. Related to which is a miraculous instance of St. Gerasimos’ (whose Polyclinic chapel he served) concern for him,. On the 20th August 1978, while at St. Nicholas, Kallisia, he had a heart attack (myocardial stroke). He was rushed to the “Hygeia” hospital, where he remained for twenty days. When he left the infirmary he continued his convalescence in Athens in the homes of some of his spiritual children. This was for three reasons. Firstly, he couldn’t go to St. Nicholas, Kallisia, as there was no road and he would have to walk a long way on foot. Furthermore, his house in Turkovounia did not even have the most basic comforts. Finally, he had to be near to doctors. It was a long held desire of the Elder’s to found a holy convent of his own, to build a monastic foundation in which certain devout women, who were spiritual daughters of his, could live. He had vowed to God that he would not abandon these women when he left the world because they had been faithful helpers of his for many years. As time went on it would be possible for other women who wanted to devote themselves to the Lord to settle down there. His first thought was to build the Convent at the place in Kallisia, Pendeli, which he had leased in 1955 from the Holy Monastery of Pendeli. He tried to persuade the owners many times either to donate or sell him the land required. It was to no avail. It now seemed that the Lord, the wise regulator and provider of all, destined another place for this particular undertaking. So the Elder turned his sights to another area in his search for real estate. In the meantime, however, with the co-operation of his spiritual children, he put together the legal charter for the foundation of the Convent and submitted it to the proper church authorities. Since he had not yet chosen the specific place where his convent would be built, he identified Turkovounia in Athens as the place where it would be founded. Here he had a humble little stone house, which, without even the basic comforts, had been his impoverished abode since 1948. Elder Porphyrios did not do anything without the blessing of the Church. Thus, in this instance he sought and received the canonical approval both of His Eminence the Archbishop of Athens and of the Holy Synod. Although the relevant procedures had started in 1978, it was only in 1981, after overcoming much procedural bureaucracy and other difficulties, that he was privileged enough to see the “Holy Convent of the Transfiguration of the Savior” recognized by a Presidential decree and published in the governmental gazette. The search for a suitable site to establish the Convent had been started by the Elder long before his stroke, when he was more than certain that it wouldn’t be at Kallisia. With extreme care and great zeal, he searched tirelessly for a site which would have the most advantages. When his strength had moderately recovered after the stroke and when he felt he could, he continued the intense search for the place he wanted. He spared no effort. He traveled around the whole of Attica, Evia and Viotia in the cars of various spiritual children of his. He looked into the possibility of building his convent on Crete or some other island. He worked unbelievably hard. He inquired about hundreds of properties and visited most of them. He consulted many people. He traveled for thousands of kilometers. He made countless calculations. He weighed up all the factors; and finally he selected and purchased some property on the site of Hagia Sotira, Milesi by Malakasa, Attica, near Oropos. Early in 1980 he took up residence on this property at Milesi, which had been bought for the construction of a convent. For more than a year at the start, he lived in a mobile home under very difficult conditions, especially in winter. Afterwards he settled into a small and shabby house in which he suffered all the hardship of three-months of continuous stomach-haemorraghing and where he also received numerous blood transfusions. The blood was donated with much love by his spiritual children. The construction work, which the Elder followed closely, also began in 1980. He paid for the work from savings that he, his friends and his relatives had made over the years with this aim in mind. He was also helped by various spiritual children. e, pleasing and perfect design was arrived at. 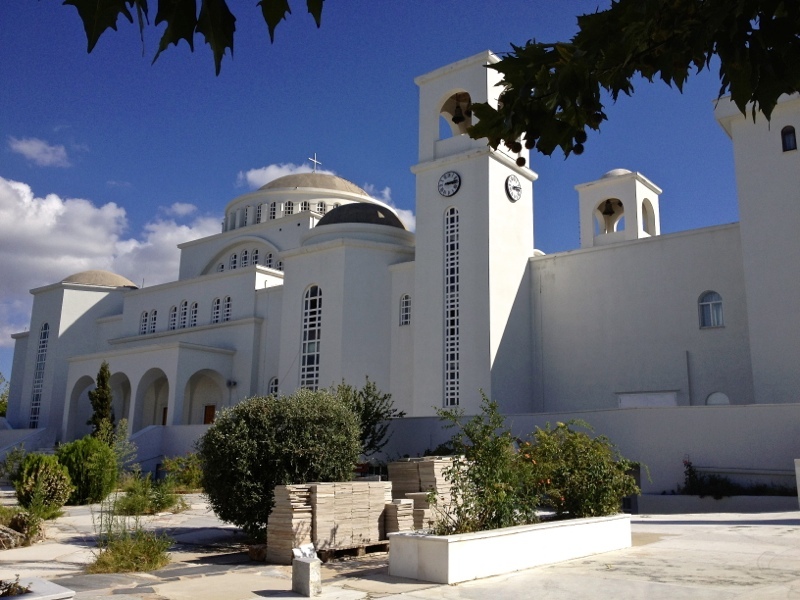 In the meantime, through the canonical intervention of His Eminence the Archbishop of Athens, the local Metropolitan (whose seat falls within the Athenian Archdiocese), gave permission for the church to be built within his jurisdiction, at Milesi. The laying of the foundations took place at midnight between the 25th and the 26th February, 1990 during an all night vigil in honor of St. Porphyrios, Bishop of Gaza, the Wonderworker. 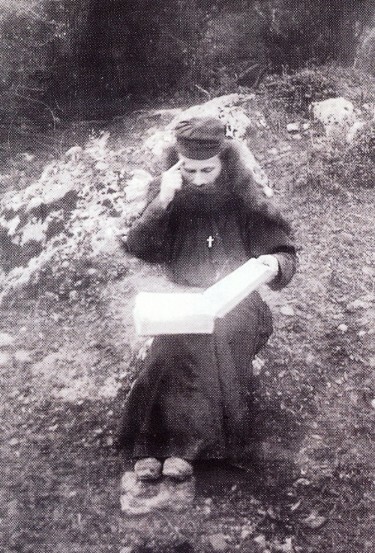 Elder Porphyrios, sick and unable to climb the eleven meters down to the ground where the cornerstone was to be laid, with great emotion, offered his cross for the cornerstone. From his bed he prayed, using these words: “O Cross of Christ, make firm this house. O Cross of Christ, save us by Your strength. Remember, O Lord, Your humble servant Porphyrios and his companions…” Having prayed for all those who worked with him, he directed that their names to be placed in a special position in the church, for their eternal commemoration. The work of building the Church (out of re-enforced concrete) began immediately. Accompanied by the Elder’s prayers, it progressed without interruption. He was able to see with his spiritual eyes – for he had lost his natural sight many years before -, the church reaching the final stages of that phase of its construction. That is to say, at the base of the central dome. It actually reached this point on the day of the Elder’s final departure. He prepares his return to the Holy Mountain. 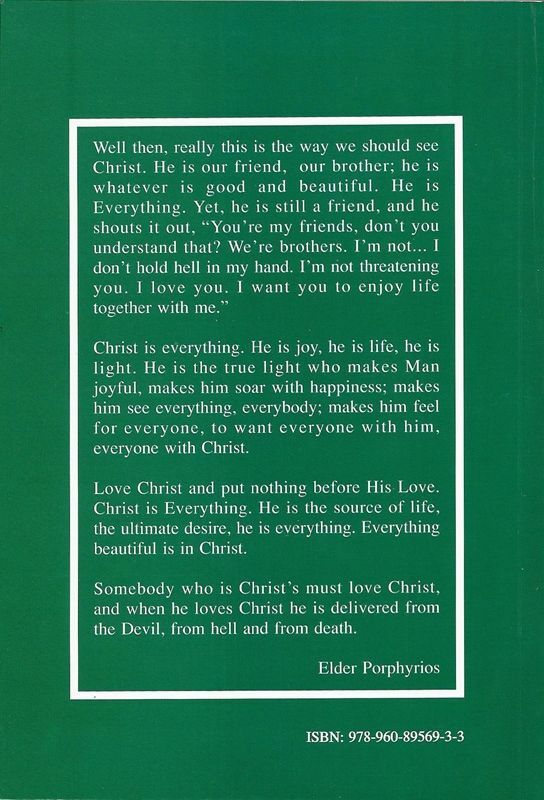 Elder Porphyrios had never emotionally left Mt. Athos. There was no other subject that interested him more than the Holy Mountain, and especially Kavsokalyvia. For many years he had a hut there, in the name of a disciple of his who he visited on occasion. When he heard in 1984 that the last resident of St. George’s hut had left for good and taken up residence in another monastery, he hastened to the Holy Great Lavra of St. Athanasios, to whom it belonged and asked that it be given to him. It was at St. George’s that he had first taken his monastic vows. He had always wanted to return, to keep the vow made at his tonsure some sixty years earlier, to remain in his monastery until his last breath. He was now getting ready for his final journey. The hut was given to him according to the customs of Mt. Athos, with the monastery’s sealed pledge, dated 21st September 1984. Elder Porphyrios settled different disciples of his there in succession. In the summer of 1991 there were five. This is the number, that he had mentioned to a spiritual child of his some three years before as the total that indicated the year of his death. A certain elder, who had prepared his grave when he felt his end was near, said to his disciple, “My son, the rocks are slippery and steep and you will endanger your life if you alone take me to my grave. Come, let us go now that I am alive.” And surely his disciple took him by the hand and the elder lay down in the grave and gave up his soul in peace. On the eve of the Feast of the Holy Trinity, 1991, having gone to Athens to confess to his very old and sickly spiritual father, he received absolution and left for his hut on Mt. Athos. He settled in and waited for the end, prepared to give a good defense before God. Then, when they had dug a deep grave for him according to his instructions, he dictated a farewell letter of advice and forgiveness to all his spiritual children through a spiritual child of his. This letter, dated June 4 (Old Calendar) and June 17 (New Calendar), was found amongst the monastic clothes that were laid out for his funeral on the day of his death. It is published in full on pages 57-58 of this book and is just one more proof of his boundless humility. Elder Porphyrios left Attica for Mt. Athos with the hidden intention of never returning here again. He had spoken to enough of his spiritual children in such a way that they knew they were seeing him for the last time. To others he just hinted. It was only after his death that they realized what he meant. Naturally, to those who would not be able to stand the news of his departure, he told them that he would be coming back. He said so many things about his death, either clearly or in a cryptic way, so much so, that only the certainty of those around him that he would survive like all the other times (a hope born of desire), can possibly explain the suddenness of the announcement of his death. His spiritual children in Athens were constantly calling upon him and he was twice forced to return to the Convent against his will. Here, he gave consolation to all those who needed it. On each occasion he stayed only for a few days, “that our rejoicing for him would be more abundant in Jesus Christ by his coming to us.” (Paraphrasing the words of the Apostle, Phil. 1:26.) He would then hurry back to Mt. Athos as quickly as possible. He ardently desired to die there and to be quietly buried in the midst of prayer and repentance. Towards the end of his physical life he became uneasy over the possibility of his spiritual children’s love affecting his wish to die alone. He was used to being obedient and submitting to others. Therefore he told one of his monks. “If I tell you to take me back to Athens, prevent me, it will be from temptation.” Indeed, many friends of his had made different plans to bring him back to Athens, since winter was approaching and his health was getting worse. 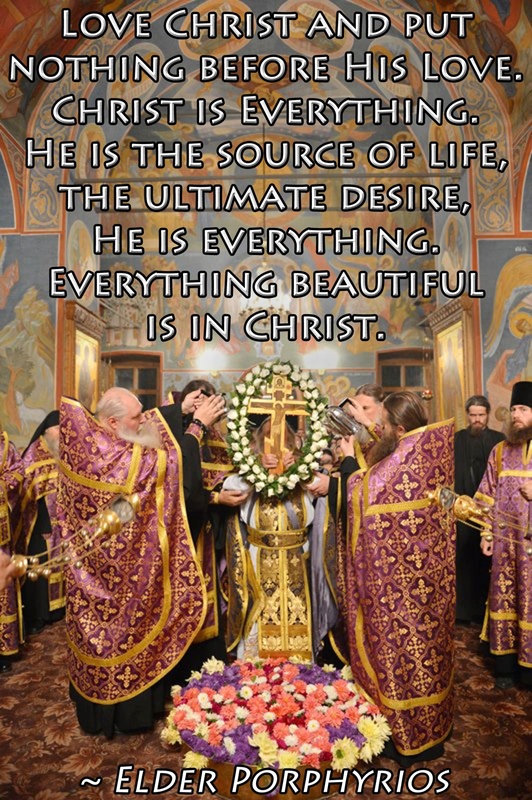 God, who is all-good, and who fulfills the desires of those who feared him, fulfilled Elder Porphyrios’ wish. He made him worthy of having a blessed end in extreme humbleness and obscurity. He was surrounded only by his disciples on Mt. Athos who prayed with him. On the last night of his earthly life he went to confession and prayed noetically. His disciples read the Fiftieth and other psalms and the service for the dying. They said the short prayer, “Lord Jesus Christ, have mercy upon me,” until they had completed the rule of a great schema monk. The Lord, his sweet Jesus came. 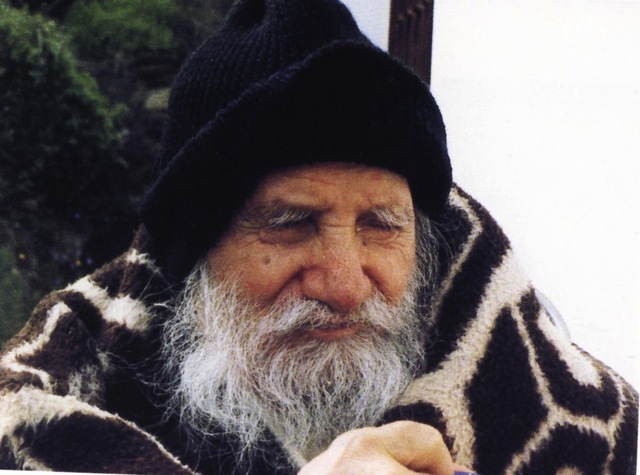 The saintly soul of Elder Porphyrios left his body at 4:31 on the morning of the 2nd of December, 1991 and journeyed towards heaven. His venerable body, dressed in the monastic manner, was placed in the main church of Kavsokalyvia. According to custom, the fathers there read the Gospel all day, and during the night they held an all-night vigil. Everything was done in agreement with the detailed verbal instructions of Elder Porphyrios. They had been written down to avoid any mistake. At dawn, on the 3rd of December 1991, the earth covered the venerable remains of the holy Elder in the presence of the few monks of the holy skete of Kavsokalyvia. It was only then, in accordance with his wishes, that his repose was announced. It was that time of day when the sky becomes rose-colored, reflecting the brightness of the new day that is approaching. A symbol for many souls of the Elder’s transition from death to light and life. The chief characteristic of Elder Porphyrios throughout his whole life was his complete humbleness. This was accompanied by his absolute obedience, his warm love and his unmurmuring patience with unbearable pain. He was noted for his wise discretion, his inconceivable discernment, his boundless love of learning, his extraordinary knowledge (a gift very much from God and not form his non-existent schooling in the world), his inexhaustible love of hard work, and his continuous, humble, (and for that reason successful) prayer. In addition to this, his pure Orthodox convictions, without any kind of fanaticism, his lively but for the most part unseen and unknown, interest in the affairs of our Holy Church, his effective advice, the many sides of his teaching his long-suffering spirit, his profound devotion, and the seemly manner of the holy services that he celebrated and the lengthy offering which he kept carefully hidden unto the end. All kinds passed by his humble cell; both holy ascetics and sinful thieves, Orthodox Christians and people of other denominations and religions, insignificant people and famous personalities, rich and poor, illiterate and literate, lay people and clergy of all ranks. To each one he offered the love of Christ for their salvation. This does not mean that all those who went to the Elder or who knew him, for however long, adopted his message or acquired his virtue, and thus were as worthy of our complete trust as he was. A great deal of care, vigilance and good sense is required, because as the Elder becomes well known, the temptation will come to some people to claim some type of attachment or connection with him. They will want to boast or to create the false impression that they are speaking for him. Apart from pure devotion and true love, apart from humble approach and honest learning, there is also conceit and personal gain. Naivety exists, but so does guile. Ignorance exists but so does error and deception. 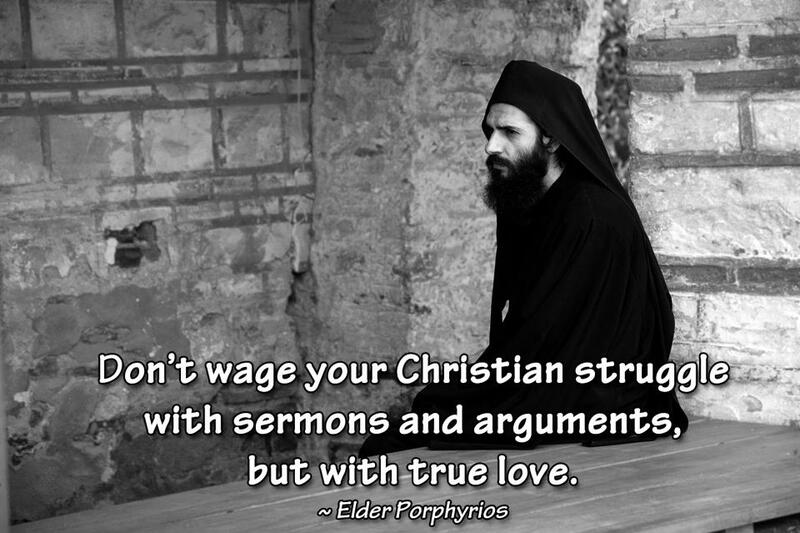 In his final years Elder Porphyrios grieved about this a lot. That is to say, many people passed themselves off as his spiritual children and let it be hinted that they did what they did with the Elder’s blessing or approval. However, the Elder neither knew them nor sanctioned their activities. In fact he twice requested that relevant notices to be written for the briefing of Christians. On both occasions he revoked the order for their publication. Here is one example. The Elder had taken a certain stance regarding various ecclesiastical issues that were dividing the faithful. This was known to very few people, who should have kept it confidential. Sometimes, however, people came who followed or expressed the opinion of one side or the other. It is not right to suppose that because a certain person saw the Elder, the opinion which that person held was then blessed by the Elder. If only we were obedient to the Elder! If only those of us who approached him had embraced his advice and in general his spirit! His spirit generally speaking was one of absolute submission to the “official” Church. He did absolutely nothing without her approval. He knew from experience in the Holy Spirit that the bishops are bearers of divine grace quite independent of their personal virtue. He perceptibly felt divine grace and he saw where it was acting and where it wasn’t acting. He graphically emphasized that grace is opposed to the proud, but not to sinners, however humble. For this reason, he didn’t agree with actions that provoked disputes and conflicts within the Church or verbal attacks on bishops. He always advised that the solution to all the Church’s problems should be found in the Church and by the Church with prayer, humility and repentance. It is better, he said, for us to make mistakes within the Church than to act correctly outside it. The Elder taught that the basic element of the Spiritual life in Christ, the great mystery of our faith, is unity in Christ. It is that sense of identifying with our brother, of carrying the burdens of one another, of living for others as we live for ourselves, of saying “Lord Jesus Christ have mercy upon ME” and for that “ME” to contain and to become for ourselves the pain and the problems of the other, of suffering like they suffer, of rejoicing like they rejoice, their fall becoming our fall and their getting up again becoming our getting up again. This is why his last words, his last entreaty to God, his last prayer, his greatest desire was that we “become one.” That was what he ached, wished and longed for. In this wonderful and simple way, how many problems were solved and how many sins were avoided. Did my brother fall? I fell. How can I blame him since I am at fault? Did my brother succeed? I succeed. How can I envy him since I am the winner? when such a spirit prevails, there is no salvation for us. We must want to be saved along with everyone else. We should, together with God’s saint, say, “If you don’t save all of these people, Lord, then erase my name from the book of Life.” Or, like Christ’s apostle, wish to become accursed from Christ, for the sake of my fellow man, my brothers and my sisters. This is love. This is the power of Christ. This is the essence of God. This is the royal way of spiritual life. We should love Christ who is EVERYTHING, by loving His brothers and sisters, for whom the least of which Christ died. 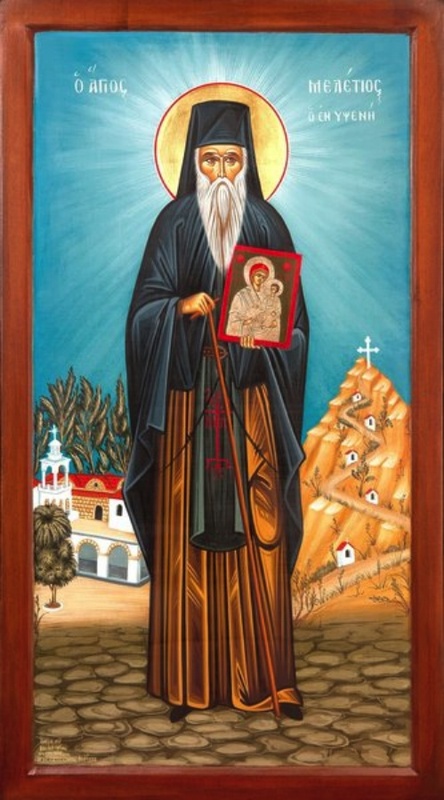 Saint Meletios was born in the village of Lardos, Rhodes, during the difficult time of Turkish Occupation. At baptism he received the name, Emmanuel. He travelled through life with little worldy learning, but held a wealth of grace, virtue, purity, innocence and great love for God. St. Meletios was a man of prayer. He discovered the deserted places about Lardos, while shepherding his father’s sheep, and calming his soul with prayer and zeal for the monastic life. On one of his excusrsions he had a vision which showed the icon of the Virgin Ypseni at the root of a certain tree. Following this vision, and led by the grace of the Virgin, he decided to follow the monastic life and dedicate himself to God. So, he built a Church in the place where he found the icon, dedicated to the Dormition of the Mother of God. The Metropolitan ordained him a Priest-Monk and made him Abbot of the Monastery. He lived a strict ascetic life… In the evenings he escaped to a cave near the monastery and prayed and during the daytime he heard confessions of the Christian faithful, giving them strength to keep their faith throughout those difficult times. God also gave him the gift of healing and he cured sick and spiritually troubled souls. He was slandered by the Turks and a price put on his head because of his work amongst the Greek Orthodox faithful. In the end, the Saint proved his innocence before the Metropolitan and then gave his last breath. He was honoured as a saint by the Christians of the island and his relics, which continually gave off a sweet smelling fragrance, were shared out to various places. A piece of the Holy Relics is kept in the Holy Monastery of Ypseni as a priceless treasure and source of healing and blessing for all those who venerate them with devotion. 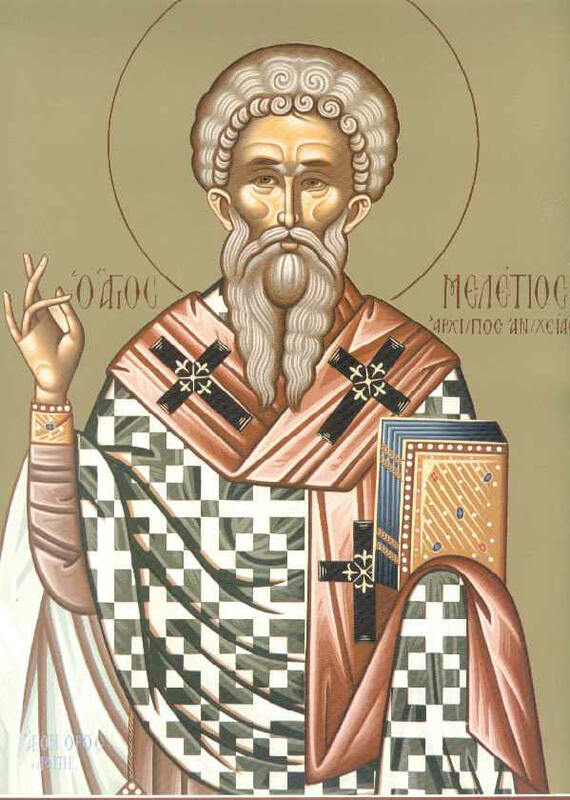 Since St. Meletios his day of actual repose is not known his feast is celebrated together with that of his namesake St. Meletios, Bishop of Great Antioch on the 12th February.